Image: Tracy Rogers provides free seminars to assist workers to recognize colleagues who may be victims of domestic violence. 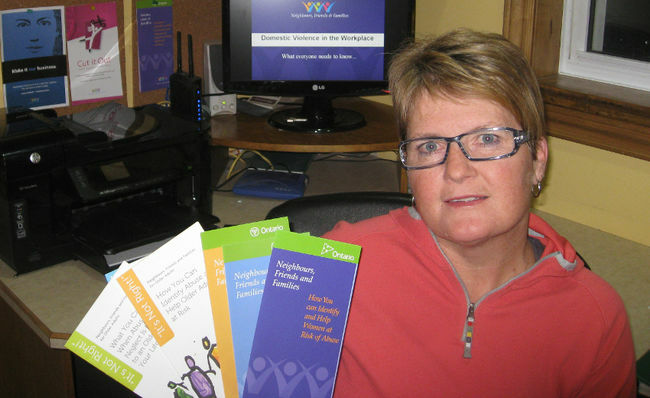 She is the facilitator at the Sarnia Lambton Coordinating Committee on Violence Against Women. It’s been eight years since nurse Lori Dupont was stabbed to death by her ex-lover at Hotel-Dieu Grace Hospital in Windsor. He happened to be a doctor and a co-worker who then committed suicide. The inquest that followed revealed that many of Dupont’s colleagues knew there was extreme tension between the pair and were very uncomfortable working with the two. After the inquest, the Ontario government’s Bill 168 was legislated to try to combat the kind of violence against women in the workplace that cost Dupont her life. Bill 168 requires employers to train workers about what to watch for and how to respond if they suspect abuse or the risk of domestic violence, says Tracy Rogers of the Sarnia-Lambton Coordinating Committee on Violence Against Women. Rogers is available to make 1.5-hour presentations in the workplace free-of-charge. The presentations are made possible by the Neighbours, Friends and Families public education campaign. Already, Rogers has talked to numerous classes at Lambton College, as well as several local workplaces. Warning signs indicating that something may be wrong with a co-worker include withdrawal, bruising, unexplained injuries, sickness or alcohol abuse. Sometimes it’s appropriate to give them brochures or referrals to local agencies that could help. “When you think about how much time we spend with our co-workers, we often know something is not right,” said Rogers. “But we don’t know what to do. A two-day workshop is being offered as part of the campaign on April 8 and 9 at the Royal Canadian Legion Branch 62 in Sarnia. The workshop is for company representatives so they can go back to their workplaces and convey the message. Rogers is available for presentations by calling the Sarnia-Lambton Coordinating Committee on Violence Against Women at 519-786-4053 or emailing ccvawsarnialambton@gmail.com.